Twice now we have gotten requests to use a photo of ours by another website or company. The first request was from Touristlink who ended up using one of our campground photos on their page. Ironically, before leaving on our summer sabbatical to Canada, we were contacted again - this time by a Canadian news network, CBC. They were looking for images to use in a special interactive website for a very popular rock band in Canada called The Tragically Hip. This hugely popular Canadian band is in the middle of a tour despite the cancer diagnosis of lead singer, Gord Downie. Perhaps in preparation for it's August 20th broadcast of their hometown performance and as tribute to this iconic band, CBC put together an interactive online feature with lyrics and sound bites from several of Tragically Hip's songs. In 2013, we took our travel trailer on the ferry from North Sydney, Nova Scotia to Newfoundland. 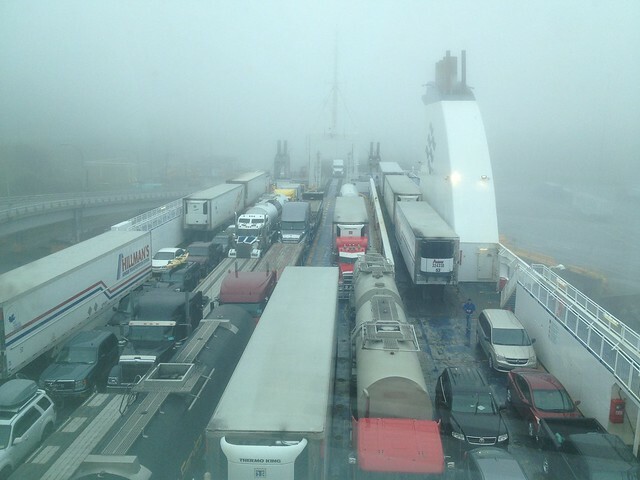 The weather on the return voyage from Port aux Basques was foggy and more ominous as this picture shows. The song Dire Wolf by Tragically Hip was inspired by a rough ferry crossing and so CBC requested the use of this photo as a visual representative on it's interactive webpage. I had heretofore never heard of The Tragically Hip, but I have since listened to some of their music. The poetic, story-telling is appealing, but it's unlikely that I will become a fan of their sound.